Trail of Cthulhu is featured in this week's Bundle of Holding, along with Keeper resources, adventures, and two campaign settings. These days eldritch horrors are to roleplaying what zombies are to other genres: A tad overused, but not going anywhere just yet. 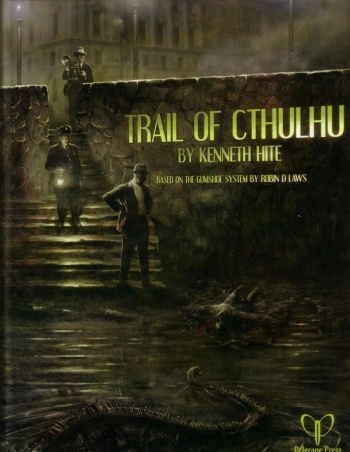 That's why so many Lovecraft-inspired games tend proliferate in this market, and next to Chaosium's Call of Cthulhu, perhaps the most successful is Kenneth Hite's Trail of Cthulhu. Using Robin D. Law's GUMSHOE engine, Trail, is a straight-up remake of Chaosium's version with one crucial twist: players can never fail investigative skill checks. That means Hite's Cthulhu is more about interpreting clues than collecting them with dice rolls ... which still won't help you once the stars align and the Great Old Ones descend. Regular readers may remember that the Trail of Cthulhu's Players Guide was featured by Bundle of Holding alongside other semi-related roleplaying books. Not having learned its lesson however, Bundle of Holding is now risking its sanity with a full-fledged Trail of Cthulhu set, encompassing the complete core book, campaign settings, adventures, and other resources. On top of the content within the Player's Guide, Trail of Cthulhu's core book includes extensive Keeper's resources with everything from Lovecraftian monsters to a well-researched historical timeline. If that's not enough, the Keeper's Resource Book & Screen is also included in the bundle, summarizing relevant rules while providing resources like NPCs. The basic bundle is rounded off with Stunning Eldritch Tales, a pulp-inspired adventure collection for groups who think they can fight off Cthulhu with shotguns and dynamite. Perhaps that will be enough for some players, but if you simply can't avoid dangerous knowledge, paying above the average will provide two additional Trail of Cthulhu campaign settings. Bookhounds of London introduces a new kind of player character; the antique book dealer who hunts down rare forbidden tomes and sells them to the highest bidder. Its companion volume, The Book Of The Smoke, is both a resource guide and in-game artifact that guides bookhounds on their travels in London. Finally, The Armitage Files turns Trial of Cthulhu into a sandbox game; players attempt to follow fixed leads while the Keeper improvises new twists behind the screen, meaning no two investigations will have the same solutions. Bundle of Holding's latest deal runs for another 9 days, and it's likely that other volumes will appear before the clock runs out. Even if they don't, the current selection is worth the price; The Armitage Files was an ENnie Award winner, and I've heard nothing but praise for Bookhounds of London. If you're looking for a horror roleplaying game Trial of Cthulhu is certainly a solid choice, just don't expect your characters to survive unscatched for longer than an adventure or two.